Cracking concrete can be a common problem. However, not all cracks in concrete means that it is concrete cancer. If left untreated, and depending on the type/area of the concrete cracking, it can lead to concrete cancer. While the majority of cracking concrete does not affect the structural integrity of a building, left untreated, it can not only be unsightly but can lead to extensive and damage to structural integrity. Concrete cancer is often caused by poor waterproofing. This is where water ingress has occurred and resulted in the reinforcing steel within the concrete structure begins to rust and corrode. Cracking concrete can be more of a result of the hardening process. Concrete cancer, when at a very late progressive stage, often has visible chunks of concrete missing, heavy corrosion, concrete falling off or obvious signs of water ingress. Cracking concrete, depending on the level of damage, often has various cracks but no corrosion has occurred yet. Cracks in the concrete as clearly visible, there are types of cracks that require specific techniques for repairs. With variable temperatures concrete can often expand and contract due to warming and cooling. This is caused from movement of the concrete structure. While this is a predominant cause of concrete cancer, water can travel through the initial cracks in the concrete. This can be caused by stress to the concrete in specific corners of the structure and depending on the scope of work, could be treated with expansion joint sealing or reinforcing steel. This refers to the weight that concrete structure is holding. The level of pressure could cause cracks in the concrete. 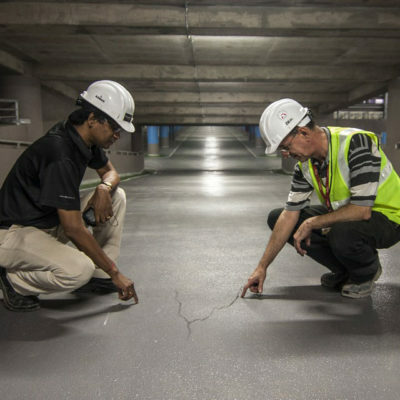 Some of the most common causes of cracking concrete are poor initial construction, design defects, exposure to the elements and the quality of the materials. When repairing cracking concrete, BUSS uses various techniques depending on the scope of damage. A common technique required in crack sealing and injection. Concrete structures are continually exposed to natural and manmade elements which, over time cause the deterioration of a concrete structure. No matter the situation, BUSS can provide a solution to maintain and rehabilitate any structure and environment, based on the assets operational and budget requirements. Call us on 08 9444 1732 for more information.